There’s never been a better time to become an online instructor. Udemy is the online learning platform. If you are any sort of blogger, online teacher or YouTuber, you should consider Udemy. Udemy (Academy of You, geddit?) is a great way to publicise your personal brand – and you can also make money there. The average Udemy instructor will earn around $7,000 – but that takes a bit of work. Read on find out how. I don’t care who you are, you should blog. And, in addition to this, you should publish content to the major social networks and, particularly if you’re interested in online teaching, YouTube. Your blog/site should also be used for lead generation as you should offer a free ebook/video course as an incentive to join an email list. 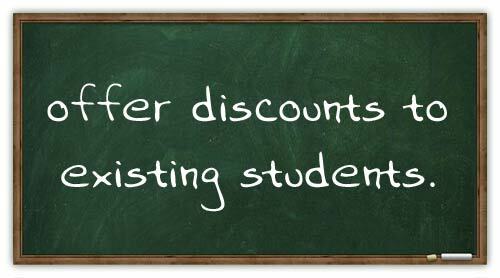 This list and following can then be offered your courses at a discount. Having an online presence is a “must” in today’s new business environment. But it will also help you with marketing your Udemy courses. I have to admit I didn’t do much of this. I already had video material on my YouTube channel that I had some pretty much ready-made courses to give away for free. You can search the Udemy marketplace to see what’s on offer. What’s selling well? Where are the gaps? Try to niche it down. Don’t create courses that are too general. 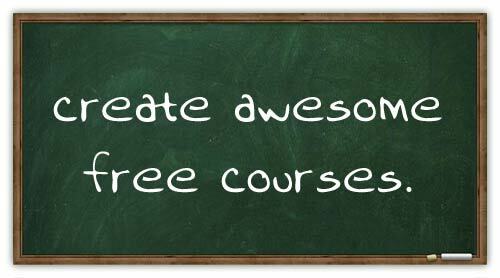 For me, the best way to start with Udemy is by creating free courses. I had lots of video content and blog posts I could repurpose into comprehensive courses. This meant I got a fair amount of students instantly and I could gauge their needs from their questions and feedback. Free courses contribute to your brand. People will get to know you, your voice, your name, your logo, etc. They will naturally seek out your paid offerings. You can also promote your paid courses, where relevant, within the videos of your free courses – this may be against a strict interpretation of the Udemy rules but it seldom gets picked up. Here is a Udemy course checklist you may find useful for creating your first Udemy course. There’s not much difference between a paid course and a free course on Udemy although you have to apply to become a premium instructor. Here are some of my paid courses. Creating a Business Website with a Responsive Design. Over four hours of WordPress and Genesis tutorials showing design, PSD to WP, and proper setting up of a real business site with JS sliders, blog, featured images, the lot. Blogging, SEO, Social & Relationships: Total Web Marketing. This course follows on from the previous one and shows how to attract clients through blogging, on-site SEO, social media and relationship with other bloggers. Running A Web Design Business. How to make money running a web design business from home. Included: hardware and software, getting clients, handling clients and projects, how to get paid, what to charge, contracts, proposals, branching out, passive income, the future. Udemy won’t do much to sell your course for you, so don’t underestimate the importance of marketing when becoming a Udemy instructor. As I said in the introduction, I can’t overstate the importance of creating your own personal brand and a mailing list so that you can present unique offers to your existing fans. If you have created an excellent free course it shouldn’t be too hard to get students. You can promote your paid courses to your free course subscribers via Udemy’s announcement system. Unfortunately further enticement can’t be made with discount coupons as Udemy has banned offering coupons to students on free courses. 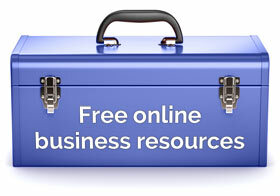 Free courses are very popular and the students/subscribers on these courses can often purchase paid courses. Another thing you can do is form relationships with other Udemy instructors and promote their courses to your students in return for their promotion of your courses to their students. This can also be done through the use of discounts and/or Udemy’s affiliate scheme. Udemy and their students love courses with lots of students and good reviews. 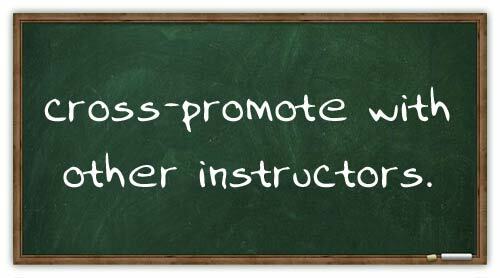 To encourage good reviews on new paid courses, offer the course for free in return for an honest review. The best place to do this is at one of Udemy’s thriving Facebook groups. Put yourself in the position of the potential student. Explain to them how to do something rather than how a piece of software works. The really successful instructors all have coherent and consistent branding in their main course images. You can also add further color coding to denote subject areas. This high quality and consistent branding should be seen in all areas of your course from the video intros to the downloadable materials. Here you can see all my main course images, although I’m sure I can make them more consistent and better – it’s on my do-to list! You can teach courses online and help thousands of people improve their knowledge, know-how and lives. Sign up here to Udemy and be guided through the course creation tools. Remember Udemy is only a platform for you. Platforms can come and go and they can get rid of you at the drop of a hat. So remember to keep copies of all your course materials. And, you can always sell your courses independently. Udemy has no exclusivity on your material. So far, I’m loving the Udemy platform. Their staff are approachable and helpful both through Facebook groups and email communication. There’s a wonderful supportive community of instructors and tangible excitement of working within a growing entity. Yes, Alexandra, as you say, I did have a lot of videos up my sleeve and that made creating an initial free course very easy. And, as always with a new platform, there may be teething problems. That’s great to hear, Francisco. If you’re around on Tuesday evening we can talk about it. Or, feel free to ask me any questions about the platform. Every time you finish 1 goal, cross it out from your list. This’ll hopefully keep you motivated to finish your course. My question to Rob: It would be interesting to know how much you’ve made by selling your Udemy courses. Thanks for that procrastination tip, Rahat. That’s exactly what I do. Every evening (when it’s quiet) I record the video. I edit it the next day. So that’s one video a day. So it takes me about a month to complete a course. (That’s not the full story – it takes time and thought to plan out the course and think of a good idea for what people want to learn about). Not being able to get the customer info of the people that take your courses from udemy IMO is like the #1 reason why it doesn’t seem worth it.. If thousands take your free courses what good is it if you don’t get their contact info to try and promote your paid ones etc? Hello Chris, nice to see you here. I really enjoyed listening to your podcast, especially your interview with Ty Cohen which really inspired me to write Kindle books (hopefully I’ll be publishing within a month). Correct, Udemy doesn’t hand over the addresses, however sending an announcement with special offers is the next best thing. You can be sure it will hit your followers’ inboxes – possibly with a greater opening percentage than my subscriber emails! Udemy’s cut varies but they usually take around 25-30%. Oh that’s not so bad then. For some reason I thought it was 50%. Either way seems like a good place to sell extra products + I believe the market perception for Udemy is probably more towards the higher quality / higher end side of things anyway. So it’s good to be associated with that. Ok cool, we will have to sync up sometime to chat about other stuff you got going on as well. I just hope Udemy keeps its reputation. 1. Adding surprise bonuses to your course that you mention in your intro video and have them go to a landing page off of Udemy. Maybe even remind them throughout. 3. A course completion bonus. 4. Interviews with other experts that complement the course but they would have to get by going to your landing page. 5. Use case studies that go with each lesson in pdf form and each one links to a lead page. I guess it comes down to whether or not you can promote other web platforms of yours via your videos or even links within your pdf downloads. I checked and didn’t see anything on their site or terms. Hello Jason, basically I think all of your ideas a worth a go. I certainly do most of them myself and they all work. However, I would proceed with caution. Udemy want you to bring customers to their platform not the other way round. On the other hand, you are creating video courses which could last 2 hours with take away materials like PDFs, etc. Inevitably, all this material will be branded with the course creators identity and, if a student wishes to know more, they will be able to find out. And Udemy know that. 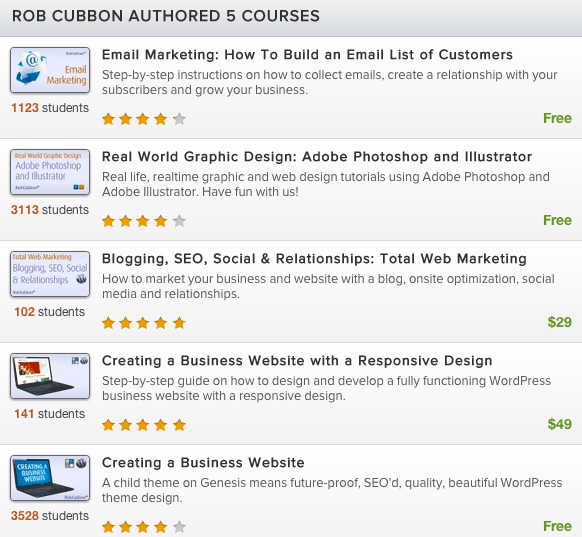 I regularly mention in my Udemy courses that if they go to RobCubbon.com/free they will receive free e-books and free newsletters on the subject of running an online business, WordPress, design, etc., as well as notice of free Kindles and the biggest reductions on future courses. And I say this over a screen showing the URL RobCubbon.com/free in very big letters. I’m not sure if Udemy like this but they can not screen the contents of 16,000 courses 100% of the time. Again, proceed with caution. Links to your squeeze pages in PDFs or even in lecture descriptions on the site are quite alright as well. As far as I know, it’s not against their terms. But I only put them in where it’s relevant to the subject matter in hand. See might interest you: 5 Great Ways To Collect Email Addresses You Probably Didn’t Know. Let me know if you have any further questions about Udemy, Jason. Thanks for the response Rob! This will help as I decide how I want to use Udemy (if at all). Either as pure lead generation, course sales, or a bit of a hybrid. Have you noticed decent numbers of those taking the course that end up over to your email list? Not sure if you tracked that using a special link like RobCubbon.com/UdemyGift or website referrals in analytics. Now I just have to narrow down which course I want to roll out first on this platform and my main objective. I look forward to experimenting. Rob, do you have any tempalte for how to outline a speicif course? I mean, someone like me would like to know where to start and how to plan the whole thing. I planned the course out as I would plan out a blog post or a Kindle book, M.H. – with a mindmap. So a piece of paper with the subject of the course written in the middle and then draw lines off the centre to subjects you’d like to cover, then draw lines between the subjects to work out the relationships between them and the order in which to cover them. Plus you can reorder lectures in the Udemy dashboard. I hope this helps. Hi Rob, I have a quality WordPress PLR course I purchased a while ago, is it allowed to use this kind of material to create a Udemy course? I was thinking to add more modules such as security etc along with the PLR material. Hi M.H., you can ask Udemy about whether you’re allowed to do that or not. But I think it would be easier to create the course yourself. And there’s a lot of competition on WordPress courses. It’s best to show people how to do something using a screencasting tool such as ScreenFlow. Otherwise you’d just be reading from the PLR course and that could get a bit boring for the students, in my opinion. I’ve just got around to watching your video guide on udemy and it’s fantastic! One question though. Where you choose who you can maket the course to, can you select other authors courses, not just your own? That is one heck of a tip, thank you!